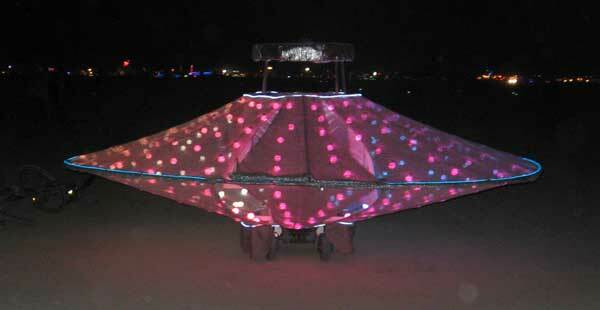 The Cubatron Ship is an art car last seen at Burning Man 2007. 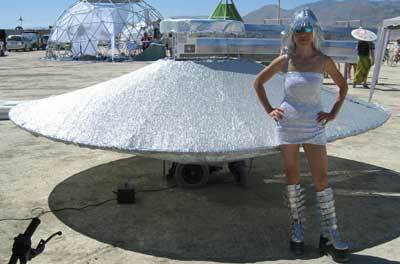 The Ship is a flying saucer shaped ship, appromixately 13 feet in diameter and 6 ft high. 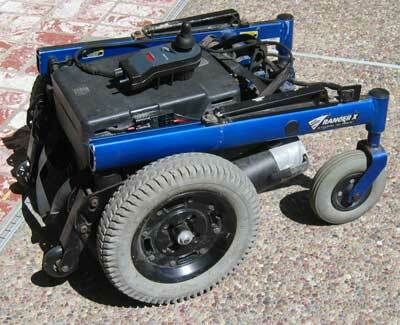 It is based on an electric wheelchair platform (an Invacare Storm Series Ranger X). On top of the wheelchair base is a bench type seat capable of holding up to 2.5 persons. The vehicle has a top speed of under 8mph. Steering is controlled by a joystick. The outer shell of the ship is contructed from aluminet shade cloth stretched over a thin structure of tubing and steel cables. This allows the captain to see in all directions around the ship. The ship can move in any direction (forward, reverse, left, right) and it can spin around in place. Underneath the seat are two 12v 50Ah batteries capable of providing a range of about 15 miles per charge. Batteries are charged at the main base from the Camp generator. The Ship is covered with Cubatron like RGB LED lighting. There are 384 lights covering the outside of the ship. These are under complete computer control and display an amazing variety of cool lighting effects, making the ship a mini-Cubatron like mobile art sculpture. In addition the Ship has a forward facing white LED headlight for visibility when in motion. There is no sound system. The base is an Invacare Storm Series Ranger X electric wheelchair. The Ships home base is Camp I Am. This camp has a number of other art cars. When the Ship is not in use or is recharging at night, it will be out in front of the camp displaying computer controlled lighting effects.